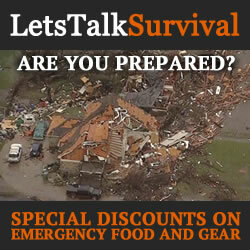 As an experienced prepper and survivalist, I have come to the realization that I can’t think of every scenario and solution that I need to prepare for, nor could I reasonably prepare for all of the scenarios that I can think of. I can however, plan and prepare for the most common. 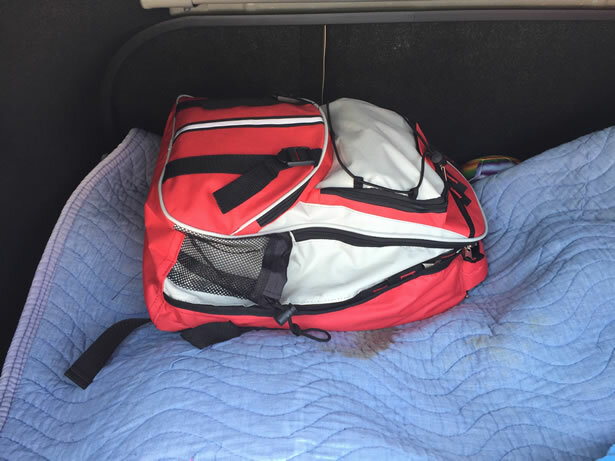 When I first started putting emergency and daily carry packs together for my family and I, the costs were enormous and they were all to often filled to the brim with triplicates of everything under the sun. Over the years, I have realized areas where I did not need to buy the most expensive gear just to find quality, or the need to carry a solution to solve every problem that I might face. It is important that your kits are customized in a way that meets your current needs to solve any real-world situations that you might actually run into. It is also important to change your gear regularly as necessary, accommodating seasonal and environmental differences. For example, I live in an urban part of the California desert where it does not get below 50° even in the coldest parts of the winter. As a result, I really don’t need anything more than an emergency blanket and a bivvy if my car happened to break down leaving me too far from home to walk. I also don’t need to carry a trauma center with me or five-ways to start a fire. I do however need plenty of water and ready-to-eat food. If I am heading out of town for the wilderness, most of my gear will change accordingly. Living Rational has put together a series of single and multi-person general emergency kits and those specifically tailored to various emergency scenarios like earthquakes, hurricanes, tornadoes and so on. 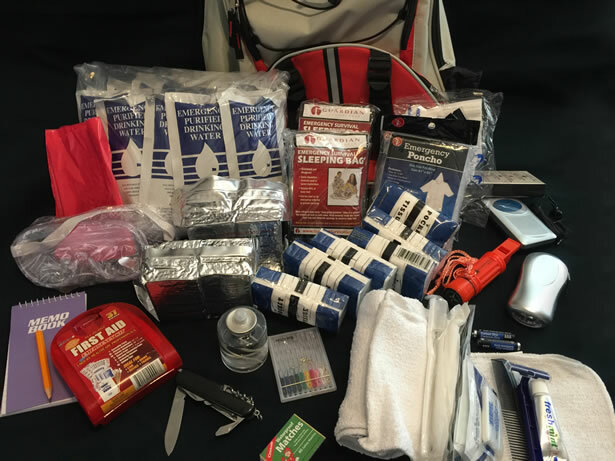 Each 2-Person Guardian Deluxe Survival Kit is loaded with the basic necessities and some comforts to help two people survive in an emergency. Sure, they don’t include everything that you might need, but they do look like they might be a great platform to build from. The pack itself is a fair quality, made from lightweight nylon in both red and grey. It is certainly not a high-quality backpack capable of lots of active use. Those tend to cost more than this entire kit alone. But it should get the job done for a while. 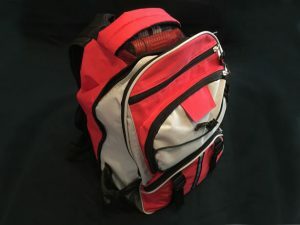 In addition to the main pocket, there are 6 smaller organizational pockets located around the pack and one mesh bottle holder on each side. The shoulder straps are lined with a padded mesh fabric for good airflow and comfort. Food and water are two of the most important resources to consider in any emergency plan. The Living Rational Deluxe Survival Kit includes 24 of the 4-ounce purified emergency drinking water pouches. Pouches like these are better for emergency kits like this because they are more compact and much lighter than plastic water bottles. Additionally, the kit comes with 20 water purification tablets, each purifies one liter of water rendering it free of pathogens and safe to drink. The kit also includes two 2400-calorie S.O.S. 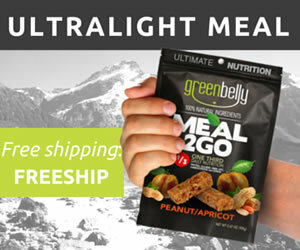 Emergency Rations which have six 400-calorie bars in each. With an 800-calorie diet, that should last each person up to 3 days. The food bars and water are US Coast Guard approved for a 5-year shelf life under any climate condition. I also like to bolster my emergency kits with extra stuff like chewing gum, tic-tacs and 1.25 ounce bags of jerky just to make myself more comfortable if I ever find myself digging into it. I am also sure to rotate any items that expire as necessary. Emergency food bars like Tac-Bar and Mayday food bars are very highly rated options when these near the end of their shelf life. Shelter is another one of the most important considerations in an emergency situation. This kit provides two mylar emergency survival bivvy bags and two mylar emergency ponchos which should cover most warm weather situations. For cold weather, you would certainly need to pack accordingly with extra clothes and cold-weather gear. 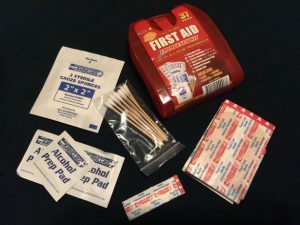 The first aid kit included with this kit is very minimal 37-piece kit that includes only the basics… A few band aids, cotton swabs, gauze pads and alcohol pads. While that is probably enough for most situations, I would surely add a couple rolls of gauze, ace bandage, surgical gloves, Carmex, pepto tabs and various antiseptics. I also like to pack at least one or two Israeli bandages, QuikClot, and at least one R.A.T.S. tourniquet or CAT tourniquet for more serious trauma emergencies. The tools provided in this kit are very limited, but can easily be augmented to meet your needs. There is a decent 16-function knife in the kit with many common tools in addition to blades like screwdrivers, saws, files can opener, cork screw, and even a toothpick. The deluxe kit also includes a pair of safety goggles and two NIOSH approved N95 dust masks for those situations where you need to protect yourself from harmful dust and ash. I always include a small roll of Gorilla Tape and some zipties in all my packs. I like to add a 5-in-one screwdriver, some kind of adjustable pliers or vise grip and an adjustable wrench in packs that go into my vehicles as well. This kit includes one small pencil and a simple wirebound notepad for note taking, and a deck of playing cards to keep you entertained in down time. I like to add at least one pen with a lid and some kind of felt permanent marker incase you need to leave breadcrumbs as you mark your path. For personal hygiene and cleanliness, the kit comes with six packs of pocket tissues, one waste bag and a small sewing kit as well as two personal kits, each includes one toothbrush, one packet of toothpaste, one small bar of soap, one packet of shampoo/conditioner, dental floss, one packet of lotion, one packet of deodorant gel, one packet of shave cream, one twin razor blade, one 5″ comb, 9 wet napkins, one wash cloth and four maxi pads. I always add a couple packs of Wet Ones wipes for those messy situations and a handful of Qtips sealed in a plastic tube or ziplock bag to all my kits including my EDC. Some of the other survival items provided in the kit include a box of waterproof matches, one 30-hour emergency candle and a 5-in-1 survival whistle. Additionally, there is a 3-LED flashlight that recharges simply by squeezing a lever and a small AM/FM radio with headphones. Not a lot of quality on these items though. Enhancing the kit with at least one high-quality flashlight like the Fenix UC35 would be an immediate priority in my opinion. They can provide enough light to fend off danger, they can be seen from a great distance and last a very long time. Plus they have features like strobe and SOS when you need to signal for help. In my kits, I also like to include a small headlamp like the Fenix HL10 and even a Streamlight 73001 as a spare almong with a spare set of batteries for both. I feel having a shemaugh is also important. Not only can you protect yourself from the sun, you can pre-filter water with it, use it as a sack, and even use it as a sling. Augmenting your kit with a lightweight water filter like the Survivor Personal Water Filter, Bic lighter, some lightsticks, paracord, and a few carabiners can also come in very handy. Having an extra change of clothes on hand is not a bad idea either. Throughout the article as I detailed the items included in this two-person 72-hour survival kit, I also felt the need to provide some recommendations for enhancing the kit with items that I personally use and add to my own survival kits and the survival kits that I put together for my wife and children. Please take my personal recommendations for what they are… Just some product ideas to help complete the kit that you might or might not have considered before. After taking a close look at this kit and enhancing it for my own use, I think the people over at Living Rational have put together a rather nice 72-hour survival kit for surviving many common emergency situations. Sure, anyone can purchase all of these goodies individually for building their own kits from scratch, and maybe even save some money doing so. But it does take a lot of time and effort to do it all yourself. I know… I’ve tried many times. Sometimes the time you save is worth much more than the extra cost. Additionally, to save any real money you typically have to buy things in bulk, which is not a necessarily bad thing if you can actually use the extra gear and personal items. Otherwise you really aren’t saving anything at all. This kit is targeted at those individuals who are just getting started in prepping, and those who don’t want to deal with hassle of finding and gathering all the little stuff themselves. While this kit is certainly not by any means complete, it does however provide many of the necessary basics making it a great platform to build from.